Darren Ellwein has been principal of Harrisburg South Middle School, Harrisburg, South Dakota for eight years. He has always had a passion for technology. Darren believes technology and personalized learning has a transformational potential for growth in learning, for teachers and students. I’m very fortunate to have met and spent time with Darren in Minnesota at the TIES conference and in California when he was at a Google event. 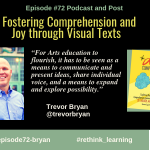 I love sharing his stories and videos with schools and am excited to share excerpts from the podcast with you. 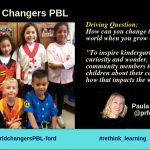 Why are you so passionate about transforming education? We all know at some point that time is pretty short with what we feel like we’re called to do. For me, I want to make a dent in changing education before I’m done. You have to start sooner rather than later because changing education is so difficult at times. When we go to conferences, I meet people like you, and it seems like everyone is ready to change education. But then when you step back and you come back to the real world of education, you realize there is still a very small percentage making those changes. I think the goal is how do we get to the point where our thoughts and our proven research on what we’re doing in our schools and what you’re doing can scale so more people see the value in it. I think a lot of it is that people are scared. The risk-taking component is so hard. That’s one of the things from day one I’ve preached. 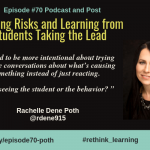 I want educators and kids to take risks. You need to be able to step out there and to say I’m doing this because I know where my kids are at today and it is not where education is. So we really have to look and value where the learner is at right now. Why is it so important for students to be creators and to inspire them to greatness? I’ve been talking with a really good friend of mine in North Carolina, Derek McCoy@mccoyderek a lot lately and we’ve been in middle school for a long time. We talked about Middle School as the forgotten area, and so I’ll talk about middle school and then go bigger picture. There’s so much power in a middle school kid. It just came to me yesterday when we had some people visiting our personalized learning framework. I said to Derek that I realized Middle School’s one of the best places you can bring about change because kids are changing themselves. I think there’s something because of the fact that their bodies, their emotional being, everything is changing, then we can grip on to some things to help them understand why this change is important. I think when it comes to students if we talk about greatness and if we talk about creativity, they’re going to do it. A lot of times, we get so stuck into “okay” or here’s “a, b, c, d” of my lesson. What’s more important is what experiences they are getting from their education. We spent time with the staff for a couple hours and talked about what is our purpose. This purpose is going to define everything else that we do. It came down to deciding as a staff that our purpose is relationships. So then if we’re doing personalized learning. 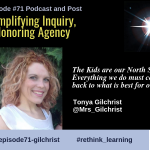 does personalized learning fit relationships? If we can prove it does, then it’s a part of what we do. Even starting this year, I was less concerned about the logistics of our district policies. I was more concerned about the culture of my teachers, and the fact that I can have a sixth-grade teacher hardly ever talk to an eighth-grade teacher in the hallway. So we did kind of a speed-dating question time for about a half hour just so people could talk and get to know each other. I want people to love what they do and to know that they have a purpose and drive. But it all comes down to how do we relate to each other. 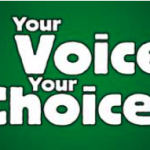 How do you encourage voice and choice for both students and teachers? We include our learners in the process of the student handbook by selecting learners and teacher representatives at the end of the year to give me feedback. They quiz the other learners in their grade level on what they want for some changes, this is what we think others might go for, then they meet with our team leaders to finalize the handbook together. Middle school kids have so much to offer in what their input is. But the problem is in most schools, they sit in the classroom then move to the next class and that’s all they do: their spectators. We have something called iChoose which will probably be talked about later. 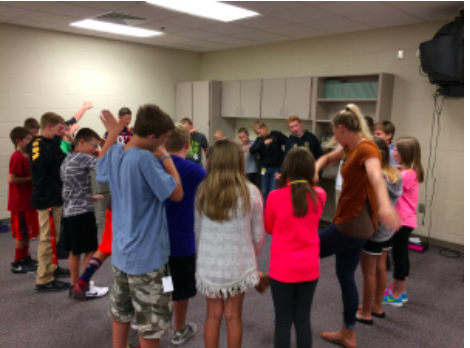 It is a combination of Ed Camp meets genius hour or passion projects and we do that about 10 times each semester. I’d like to do it more often but sometimes you just have to start with baby steps but most of the kids really love it. We just had one a couple weeks ago and we had kids came up with offerings like animal science, magic because we have one facilitator one teacher that does magic tricks. We bring in the community. We do coding sessions where they build 3D games. We’ve had an architect come to school. We’ve had people that do scuba lessons one year just to show the equipment. It’s all based on where their interest is at and that’s not even including our genius hour projects. These are like our high-octane genius hour projects and some of the projects are just amazing. 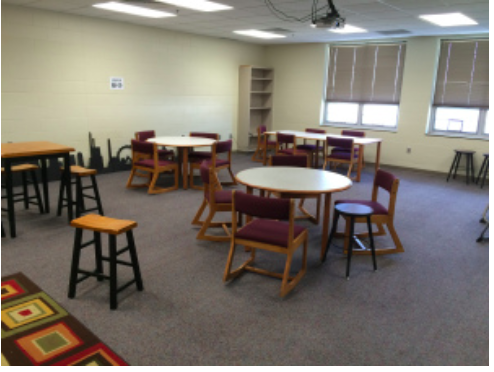 How does the learning environment impact learning? Share some of the stories about what your school is doing to create new learning environments. 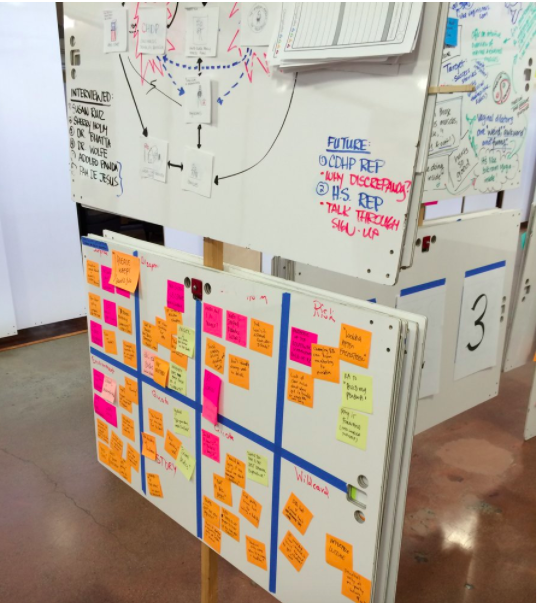 I had the opportunity to go to the Stanford dSchool with a team. When we got there, the experience wasn’t related to an educational theme or topic, it was more of going through the five steps of the process. When we got back that’s when it kind of hit us how it can apply to education more. I took about a hundred pictures and then I basically I looked at everything in my building. Every inch was evaluated to see exactly how can we use that space like right now. If you came to our school, we have learners in the hallway all over the place and this year is even crazier than last year I use the word crazy in a positive way. We have a personalized learning environment within our traditional environment. So this just happened on Friday. Our RPL kids were in the hallway and the bell rang for our other kids to go. The school visiting us saw our kids that were personalizing learning did not flinch during that 3 minute passing time. They were absolutely tuned into their personal flex time and that’s because we took the time to really train them on what’s the space look like. Actually, if you talk about student voice they’re the ones that created the norms for that space so I think you can correlate there’s a high level of empowerment when they have a voice in how that space looks. How are your learners personalizing learning? Tell us about iChoose, your student scheduler. Learners have a track of learning, personalized learning, called Team Innovate, where they don’t have a set schedule in their morning. There are four main content areas facilitators who explain their offerings for 4 or 5 blocks of time. If I teach social studies it’s not going to be the same thing for every block I’m trying to meet. Think of 50-60 learners in one room together and after the offerings are done then they open up their iPads. 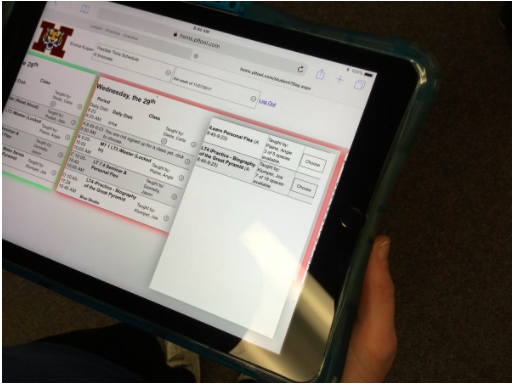 The software tool is a flex-time scheduler where learners schedule their morning based on what’s best for their learning and that’s the common language they use. If you ask a learner why they chose the offering during the B block of time, they would say because I know that’s what’s best for my learning today. That’s the voice that they have and that scheduler from personalizedlearningtools.com. It’s just been a lifesaver so instead of us using sticky notes trying to do it through Google, This is done with the scheduler within a matter of seconds or minutes and then we can get them to sign up what they want to take. I recorded one-sixth grader doing that since she had only started scheduling for about 3 or 4 weeks on her own. She looked at the camera without any prep. I asked why she likes this scheduler. She shared “how the scheduler helps her know what’s best for her learning” and that was nothing I told her to say. Why is it important to share your story? Maybe tell the way you do that and then you know the why do you do it. When I first started following Eric Sheninger on Twitter, he used this phrase “if you don’t tell your story someone else is going to.” About 4 years ago, there was something on the local TV Affiliates that was supposedly happening in our school district and they took a picture of our marquis at South Middle School. But there was nothing from the story related to our school. I didn’t get any kind of parent kick back from that. I still believe today part of that is because we push out information about our school. Every one of my teachers have Twitter accounts. I don’t monitor how much they use Twitter. We want to get our story out. We want to share what the kids and teachers are doing so people can really see what is cool and what’s going on in classrooms. 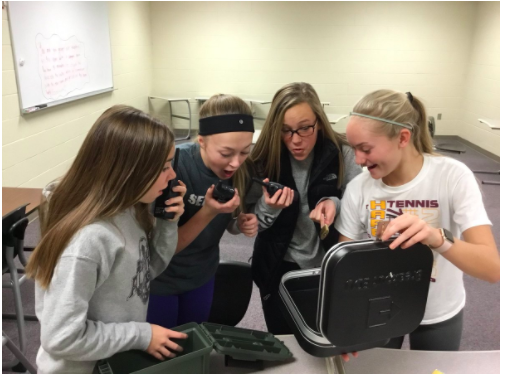 What are some cool projects happening in your school? 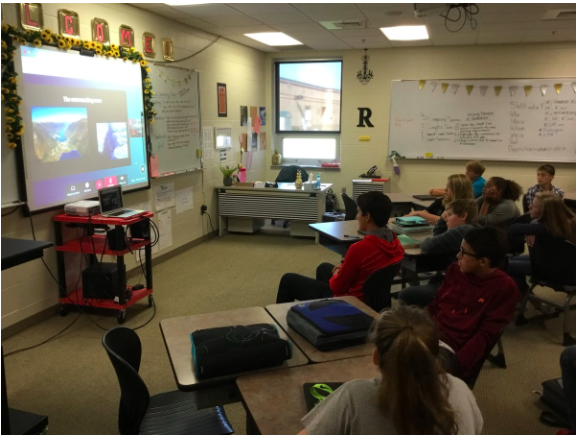 Joe Klumper @mrklumper in his sixth grade classroom found a way to make it look like you’re creating Snapchat filters to explain Neolithic and Paleolithic information. He did it through pages through the iOS framework, and it was just brilliant and that goes back to the first question that you asked you know about how do you make that change. I think again it’s you have to let people know that taking risks is a benefit and even if you fail, failure is that first attempt in learning and you just grow from it. It’s not that you cower away and stop. You figure out what’s next and how do I make it better. Within our wheel or Encore classes, I created a class called Idea Foundry. It’s based on the design thinking process so the first task within the six week course is to create a better school experience. I Leave It Wide Open on how they want to make a difference. We have two girls who wanted to expand our local food pantry. They met with the mayor and a couple of city council people. They’re getting skills that go beyond the so-called school skills. They’re getting real life skills and going to continue because they are passionate about their project. There were two 6 grade boys that weren’t engaging totally and then a light went on at one point. They are now creating a football helmet using littlebits sensors. The philosophy is if the impact is hard enough then the sensor alerts the training staff from the helmet that there could be a possible concussion. I mean you have 11-12 year olds coming up with these ideas that they wouldn’t come up with it unless you give them a space to think about it. That’s really a part of the design thinking process. I want them to understand prototyping and what’s an iteration. I’m choosing to focus more on the future things that they’re going to need for a collaborative working environment which is really what a place, like Google, exemplifies. I’m choosing to talk about being able to collaborate and understand how to iterate so it’s not the first time they’re getting feedback to make it better the next time. Why do you connect with experts around the world? 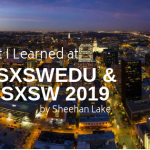 I do a lot of work with 3 schools in Norway and our kids are working with kids in Norway to complete projects that couldn’t happen unless I was willing to connect socially on a digital platform. 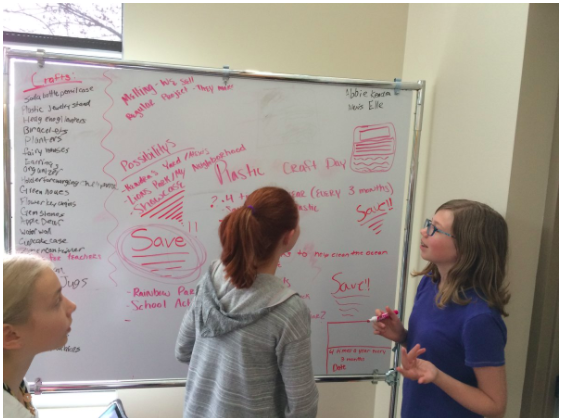 We have a Plastics pollution project that will be a longitudinal class over 3 years. We’re trying to figure out how we can prevent the spreading of the pollution problem in our Waters. Now we’re getting Bergen University professors in Norway and scientists here in South Dakota to help with the process of analyzing microplastics. If you can connect digitally through social media, you can keep going. I find myself getting overwhelmed at times because so there are many dots to connect right now and it’s hard to keep track of it. In June of 2018 we will have the first-ever Plastics conference off the coast of Honduras. There are several middle schools in USA and Norway arranging the first student led microplastic conference in Honduras in June. Darren Ellwein has been a principal for eight years of Harrisburg South Middle School (HSMS), but has always had a passion for technology. 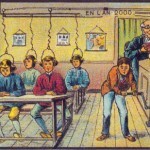 He believes technology has a transformational potential for growth in learning, for teachers and students. He has made sure every staff member at HSMS has a Twitter account which has allowed them to communicate with parents through the social media network. In addition to social media, Google Docs and Google Hangouts have played a major role throughout his school. 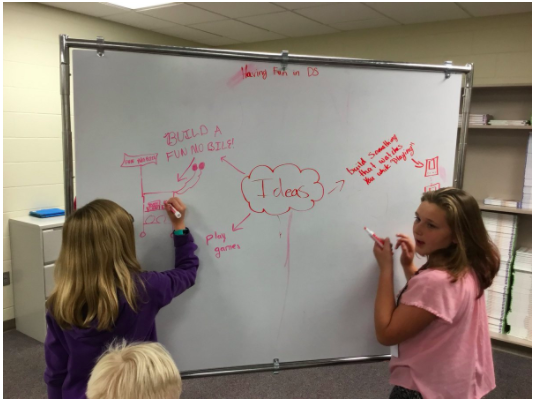 Ellwein has also created technology-based clubs such as the Drone Club and has even created Twitter Tuesdays and a Genius Hour every Wednesday which has led to the school’s Makerspace being used for prototyping inventions such as an automated dog feeder. 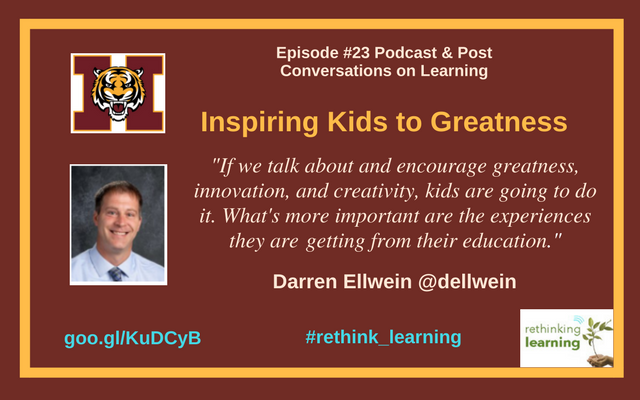 Darren believes that investing and scheduling time for students to be creators is important when working to inspiring them to greatness. 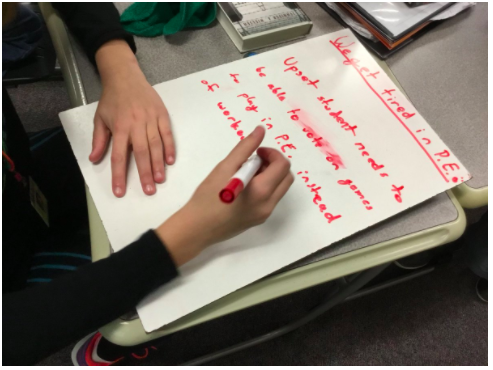 Student choice is key as they select what they want to focus on and learn about.